← Compare Republic of Ireland’s Frac Ban with Germany’s Non Ban Frack Ban: Germany redefines fracking; “Conventional” fracking allowed! Supersized new oil wells are sometimes running into existing wells, a little-noticed consequence of the shale boom that has started to trigger complaints and lawsuits. Some owners of older wells have filed reports with state regulators claiming their wells were flooded with water. In some cases, the wells became so full that the water rose to the surface and spilled over. Others have claimed that they had to shut in wells due to the damage. A few cases have ended up in court. While newer wells damaging older ones is a longstanding problem, the issue is gaining attention as shale companies employ new technologies to drill wells horizontally. 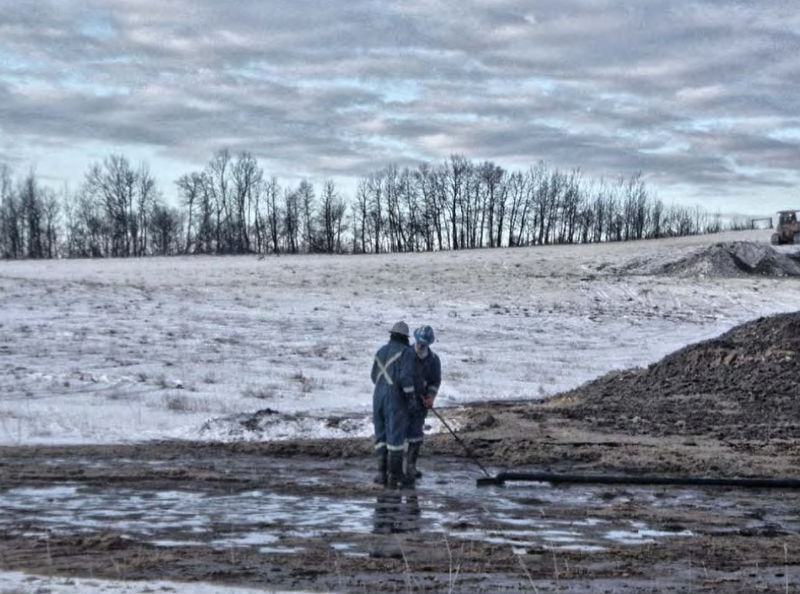 Almont Energy LLC and TLS Oil & Gas Inc., vertical-well operators in Oklahoma, sued Newfield last year, claiming that fracking jobs performed by Newfield caused an Almont well to flood with water, “negatively impacting the further development potential” of the well. A lawyer for Almont and TLS declined to discuss the case, which was filed in federal court. 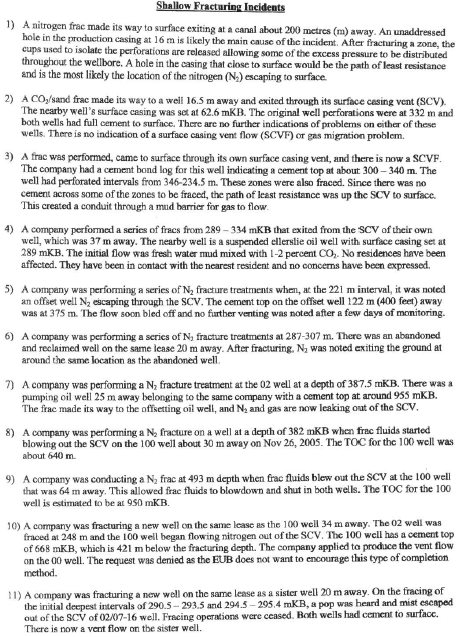 Newfield also declined to discuss the case, but spokeswoman Cindy Hassler said the company tries to be proactive when it learns of possible frack hits and works to negotiate compensation with anyone affected if an inspection shows damage. “Newfield owns thousands of vertical wells ourselves, so we understand the challenges,” Ms. Hassler said. Chesapeake and Devon, who have also been blamed for frack hits in reports to state regulators, declined to comment. James West, an analyst with Evercore ISI who has been following frack hits, said they are of special concern in places like Oklahoma and Texas, where those drilling new wells must navigate around older wells drilled over decades. 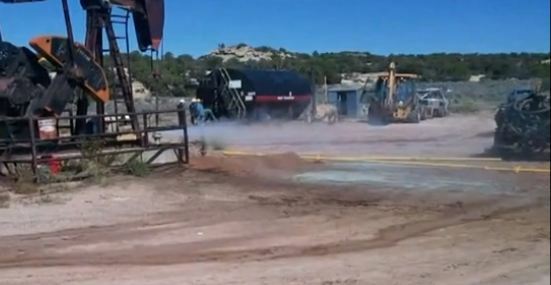 In Oklahoma, companies aren’t required to report frack hits unless there is a spill. [No concern for groundwater?] Regulators there have received fewer than 20 confirmed reports of such incidents in the last three years and are currently reviewing several more. “I know that it’s a larger problem than the data we’ve been given,” said Tim Baker, director of the oil and gas division at the Oklahoma Corporation Commission. Oklahoma last month passed a bill that eases restrictions on where producers can drill horizontal wells more than a mile long. Vertical-well operators now worry their wells are more vulnerable than before. Joe Warren, a partner with Brown & Borelli Inc., a small oil-and-gas producer, said roughly two dozen of the company’s wells have been damaged by frack hits. He believes the problem is particularly acute in Oklahoma’s Stack, currently one of the hottest oil regions in the U.S. The Stack has many vertical wells and is now also popular with horizontal drillers. “Most of the large players in the Stack have hit one or more of our wells,” he said. 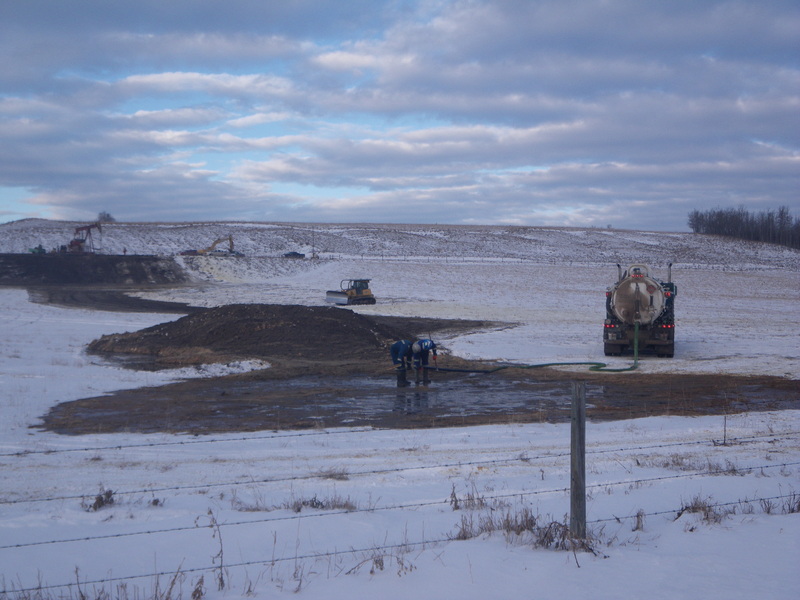 But given the potential for damage, the association supports making reporting frack hits mandatory, Mr. Warmington said, and would be open to having a mediation or arbitration process put in place. Some experts expect the situation will only get worse. 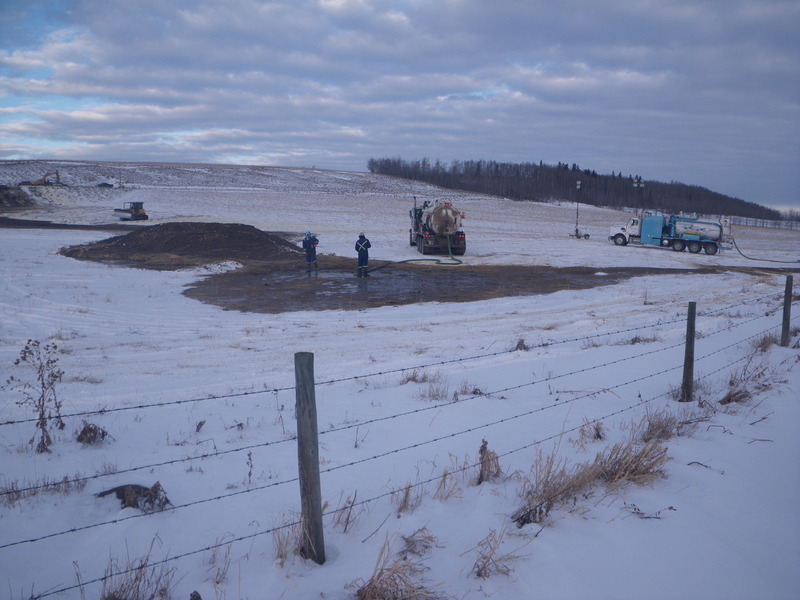 2014 01 07: As ‘frack hits’ grew in Alberta, regulator (AER) takes action, but years too late; high pressure frac hits have been damaging hydrocarbon wells for at least a decade! A “frac” can go horribly wrong when there is a “communication” breakdown during the process to one or more neighboring wells. A communication breakdown means the fracking well is causing a disturbance with a non-fracking well. 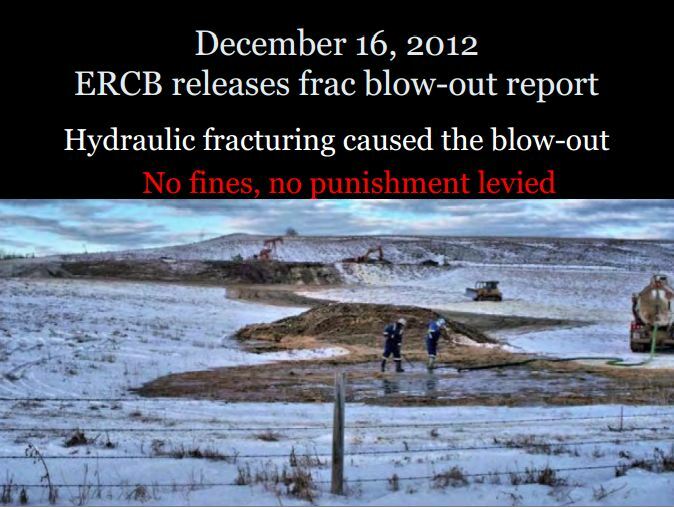 The majority of oil companies fracking in Alberta do not currently monitor their frac jobs. If the downhole pressure reaches a point to create “communication” with other wells. The result can be environmentally and financially disastrous, blowing off wellheads, contaminating water sources, spilling frac fluid and oil all over other well site leases. Trying to clean up the ERCB’s reputation (plagued with scandals and the Ernst lawsuit), it’s spots were changed to the AER. Spot removal included legally removing public interest from the regulator’s mandate. Fracture propagation via large scale hydraulic fracturing operations has proven difficult to predict. Information provided by industry to date shows that there may not always be a complete understanding of fracture propagation at shallow depths and that programs are not always subject to rigorous engineering design. Increased development at ever shallower depths. Increased Fracture volumes, rates and pressures. Increased public concern on water well protection.